Unless you’ve been living under a rock, you know by now that Bitcoin, the first digital currency in the world, has gained a lot of value in the financial markets over the past few weeks. As at the time of writing this, the value of 1 Bitcoin was well above $10,000 and is expected to rise even higher in the coming days. Naturally, with such news, it is not surprising that thousands of people, if not more, are currently looking at ways to acquire bitcoins in order to cash in on the Bitcoin Boom. Unfortunately, dishonest people (politically correct term for scams) have also decided to cash in on the ongoing crypto sensation. The only difference is, their targets are the thousands of naive and inexperienced people who have been brought in by the strong waves of publicity and sensation surrounding Bitcoin. 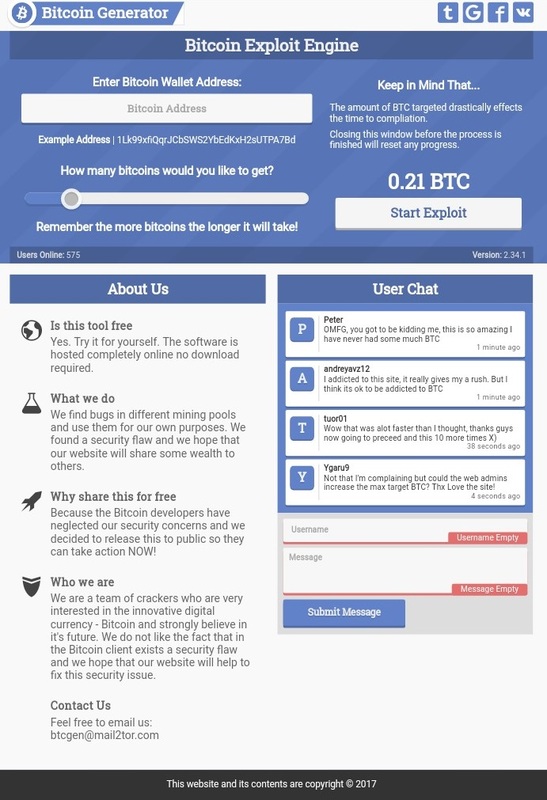 One of such scams is GenBTC.com, a self proclaimed Bitcoin generator that gives out free Bitcoin periodically. Is the site real or is it just a waste of time? Read on to find out. Genbtc.com is a Bitcoin mining site that allows people to mine and acquire BTC free of charge and without breaking any sweat. The site was established in early July 2017 which is slightly less than the recommended 6 months age for trustworthy sites. For obvious reasons, there is very little information on Genbtc.com online with the main website providing only the most vague details, presumably to disorient newbie investors. Nonetheless, we did trace the website’s IP address to 23.229.209.6. Funny enough, the address kept changing over the several weeks timeframe that we were analyzing the Genbtc.com website. Unless the owner used a top secret location hiding software, the IP address points to the site being operated from the United States. Notably, the site’s server IP is not a personal one but its owned by Godaddy.com, the hosting company that the website Genbtc.com is registered with. We can’t really tell who owns the mining site as available data shows that the domain was registered through an online privacy company by the name Registration By Proxy, LLC. Genbtc.com is a free Bitcoin generator that supposedly sends free coins to your BTC wallet within a few minutes of entering the address. The site can ‘mine’ and send up to 3.8 BTC on a single transaction. Going by the current rates, this is about $40k – more than what 60% of the population earn in a good year of hard work. 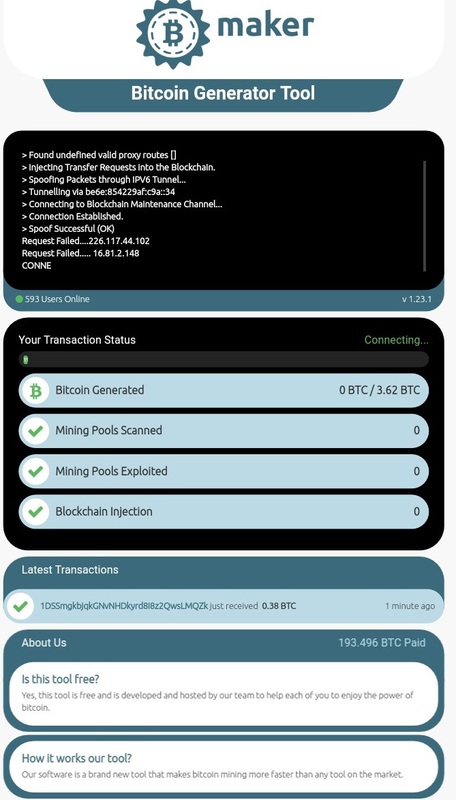 Unfortunately, despite searching all over, we didn’t find any relevant evidence to support Genbtc.com’s claims of a functioning mining software capable of generating hundreds of BTC for thousands of users in a day. We even tried keying in our wallet address hoping to receive some free coins only for the page to give back an error response which crashed our hopes of earning a few thousand bucks for free. We tried it several times and the response was still the same as you can see below. If you try out the generator, you will most likely get the same result as we got. The site will make it look like it’s a problem on your end but we know you’re clever and you will be able to figure out that they’re only taking you for a ride. For such a valuable site – in terms of BTC value that is – Genbtc.com doesn’t look the part at all. To find anything useful, you have to skim through miles of poorly written text and painfully opaque details and you still won’t find anything relevant to write home about. As a matter of fact, some icons on the top menu link to other sites which are completely different from Genbtc.com. Specifically, the Buy Bitcoin, Multiply Bitcoin and How to Sell Bitcoin icons link to Binance.com, an upcoming trading platform for digital currencies. And that’s not even the issue. The issue is, why exactly would a “Bitcoin generator” site which by virtue of its name is supposed to mine and periodically dispense BTC send its users to another site to “buy bitcoins?” That doesn’t make sense at all. Most importantly, Genbtc.com bears an uncanny resemblance to a number of sites some of which went down as a result of being exposed as scams. These include Genbtc.pro and TheBTCGenerator.com. 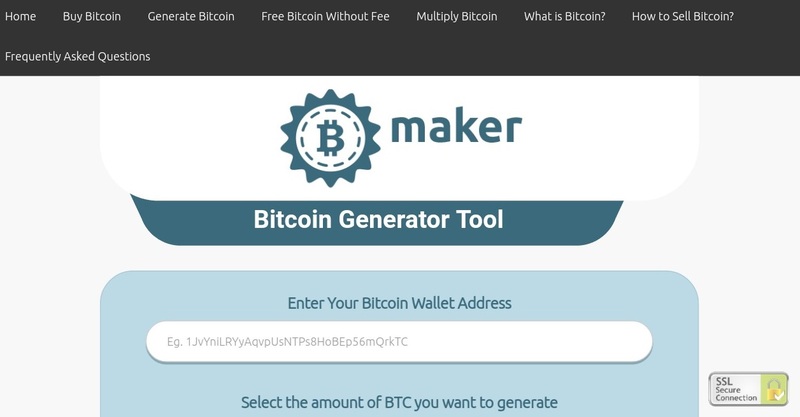 However, the most notable coin generator site that looks similar to Genbtc.com is BTCGen.Pro which was recently outed as a scam. Looking at the screenshot below for BTCGen.Pro, you will note the obvious similarities to Genbtc.com including the logo. According to a SimilarWeb popularity report, Genbtc.com has a ranking of 940,399. Therefore, based on its ranking, we can classify Genbtc.com as an unpopular site which speaks volumes, considering the type and nature of its activities. A site offering free bitcoins should have raked in more than a million total visitors and counting and not the paltry 75k visitors that have visited Genbtc.com since it’s inception. When it comes to user reviews, another measure of popularity, we couldn’t find any discussions on Genbtc.com on the various online forums that we frequent. This could be because the site is still relatively new in industry standards and many people have still not heard about it, let alone tried it out. We don’t really need to say because we believe we have said, and shown, everything there is to say about Genbtc.com, but we still have to say it. Genbtc.com is not only a scam but a waste of time and intelligence. Don’t visit the site expecting to receive any Bitcoin as you will end up disappointed. Review Verdict: GenBTC is a SCAM! Please share any thoughts, experiences or feedback you may possess about GenBTC by leaving a comment below. The vast sum of Bitcoin generators and doublers are fraudulent. If you are looking to adequately supplement your income through the application of cryptocurrency investing then we encourage you to visit our Cryptocurrency Investment Guide to learn about readily available and legitimate opportunities. Thanks for your honest review. This article save my time. Could you please review Binance? I have read reports of various issues. P.S. you may want to work on your SEO and get this site on Google searches easier. Please have someone reach out to USAPREPARES radio to promote your website and talk about bitcoin scams on the radio if you are willing.